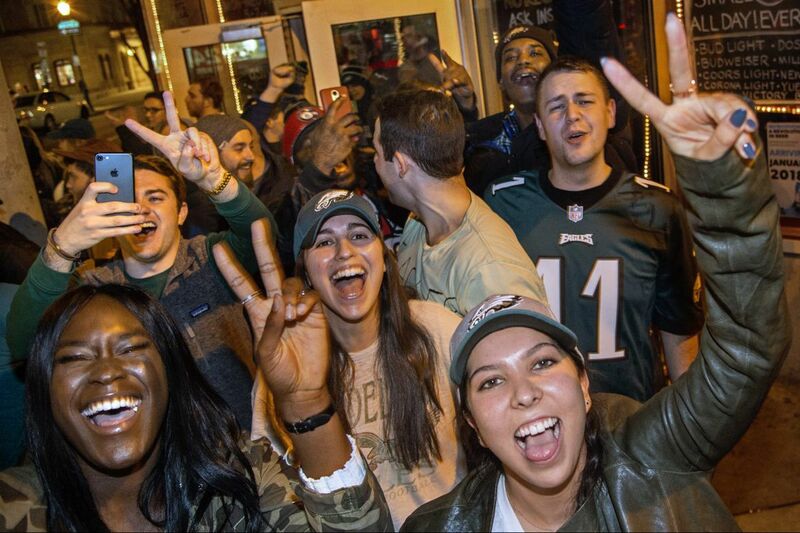 Eagles fans rejoice after the Vikings win. Will this scene be repeated Sunday night? If you want to be the best, Brandon Graham sagely observed after the Eagles won the NFC championship, you have to beat the best. The Eagles need to get through the mighty Patriots — with their brilliant coach and Captain America quarterback — to win their first Super Bowl. Bill Belichick and Tom Brady are trying for their sixth. Graham sure got his wish. So will this Eagles team be remembered fondly like the 1993 Phillies, who didn't win the ultimate prize? Or will they be hallowed like the Flyers of the 1970s, who actually won two? Here are 52 other things to consider ahead of Super Bowl LII, the only time all year we use Roman numerals. Steve Celek, father of Eagles tight end Brent Celek, prepares to march in the 2018 Mummers Parade as part of the Americans Wench Brigade. 1 Brent Celek's dad, Steve, marched in the Mummers Parade this year with the Americans Wench Brigade. Club captain Sean Keenan and his brother, Scott, told Steve Celek the only thing he'd need was comfortable sneakers, so dad quietly helped himself to a pair of Brent's. Yep, he spray-painted them gold. Even better, he returned them without Brent noticing. 2 Steve and his wife, Debbie, were at the NFC championship game in Arizona after the 2008 season when the Eagles last came close to reaching the Super Bowl. "When we saw him after the game, he was standing by himself, in tears, because he felt like he may never get there again," Steve Celek said. "This is redemption." 3 Hershel Williams, a 94-year-old West Virginia native, will perform the opening coin toss. Williams, who earned the Medal of Honor for his performance at the Battle of Iwo Jima in 1945, will be accompanied by 14 other Medal of Honor recipients. 4 Something to keep in mind as it relates to Rob Gronkowski: That touchdown catch the Eagles defense allowed to Vikings tight end Kyle Rudolph in the NFC title game was the only reception Rudolph – or any other Minnesota tight end – had all game. 5 Likewise Zach Ertz: The touchdown by Jacksonville's Marcedes Lewis in the AFC championship game was the first given up by the Patriots defense to an opposing tight end in more than three months. 6 The only NFL franchises with longer championship droughts than the Eagles are the Cardinals (1947) and Lions (1957). The Eagles' last title was in 1960, about seven weeks after Massachusetts Sen. John F. Kennedy was elected president. 7 Tom Brady is the only player left who played in Super Bowl 39 when the Patriots beat the Eagles. He's the man, he's 40. 8 "I was 14 years old and remember watching that game hoping the Eagles would win," said current Birds right tackle Lane Johnson, a native of Groveton, Texas. "Coming up short, you could feel the pain, but you can feel the passion of what the city wants [today]. We're here. It's right at our fingertips." 9 Johnson, who went to Oklahoma, played in the 2013 Senior Bowl for then-Lions coach Jim Schwartz. 10 Schwartz, the current Eagles defensive coordinator, got his first job as an unpaid intern for Cleveland Browns coach Bill Belichick in 1993. Nick Saban was the defensive coordinator as the Browns went 7-9 that year. 11 Brady has scorched Schwartz's defenses the last two meaningful times they've met. In 2010, when Schwartz was Detroit's head coach, Brady threw for 341 yards and four touchdowns in a Thanksgiving rout. In 2014, when Schwartz was Buffalo's d-coordinator, Brady had 361 yards and four more TDs. They met again at the end of the 2014 season, but Brady was yanked early on, because New England had locked up the AFC's No. 1 seed. 12 Brady and Hall of Fame defensive end Charles Haley are the only players in history with five Super Bowl titles. Haley won two with the 49ers in the 1980s and three with Dallas in the 1990s. 13 Patriots special-teams coach Joe Judge played quarterback and safety at Lansdale Catholic. He played at Mississippi State from 2000-04 and was an assistant at Alabama under Saban before joining the Patriots in 2012. 14 Patriots wide receiver Danny Amendola had 11 catches for 112 yards and no touchdowns in New England's first playoff game and 7-84-2 in the second. He's been targeted 22 times on Tom Brady's 91 passes, a shade less than 25 percent of the time. 15 The Eagles tried to hide Amendola on their practice squad in 2009, but the Rams plucked him off. The seven receivers the Eagles kept were DeSean Jackson, Jeremy Maclin, Kevin Curtis, Jason Avant, Hank Baskett, Brandon Gibson and Reggie Brown … Sigh. Reggie Brown. 16 The word "Minneapolis" means city of water. 17 Wonder whether Alshon Jeffery is still the second-most famous person ever to hail from St. Matthews, a city of about 2,000 in the middle of South Carolina. Actress Viola Davis, the first black actor to win Oscar, Emmy and Tony awards, deserves to be first. It's one thing to win a Super Bowl. It's another to win the Triple Crown. Jeffery turns 28 on Valentine's Day. 18 "We've had several people in the county go on to big things," Ross Smith, an assistant coach of Jeffery's in high school and a teacher at Calhoun County High School told The State newspaper of South Carolina. "But the Super Bowl, that's pretty incredible when you think about it." 19 Patriots massive left tackle Nate Solder (6-8, 325) had designs as a youngster on becoming a veterinarian. He protects Tom Brady's blind side, which is also a delicate job. 20 Numerologists will note that Fletcher Cox was the 12th pick of the 2012 draft, who on Sunday will be chasing around the greatest No. 12 ever. Shame his mom couldn't have hurried up one day. Cox was born on 12-13-1990. 21 Patriots Pro Bowlers: QB Tom Brady, FB James Develin, TE Rob Gronkowski, special teamer Matthew Slater. Develin went to Boyertown Area Senior High School. 22 Eagles Pro Bowlers: G Brandon Brooks, DT Fletcher Cox, TE Zach Ertz, S Malcolm Jenkins, T Lane Johnson, QB Carson Wentz. 23 This will be Al Michaels 10th Super Bowl, leaving him one shy of Pat Summerall for most by a TV play-by-play announcer. Summerall, it should be noted, was an analyst for four others and a sideline reporter for Super Bowl I. 24 Patriots cornerback Eric Rowe was traded by the Eagles for a 2018 fourth-round pick after the Birds drafted Jalen Mills in 2016. Rowe has emerged as the Patriots nickelback. He was the d-back covering Julio Jones when Jones made that circus catch for a first down that should have virtually clinched the Super Bowl for Atlanta last year. Rowe played 78 percent of the snaps in New England's game against Tennessee and 62 against Jacksonville. 25 The last quarterback to complete a pass in a Super Bowl played in Minneapolis was Frank Reich during serious garbage time at the end of SB 26 in Buffalo's lopsided loss to Washington. 26 The only time Reich faced Belichick's Patriots as an offensive coordinator was in 2014, when San Diego lost, 23-14. The Chargers had just 216 yards for the game and were shut out in the second half. 27 Patriots defensive coordinator Matt Patricia has a degree in aeronautical engineering. He joined New England's staff in 2004 as a video whiz, which means he could have been involved involved in alleged spying misadventures that many Eagles people think was a factor in New England's Super Bowl win after the '04 season. 28 After Supe 52, Patricia will become the head coach of the Lions and New England offensive coordinator Josh McDaniels will become the head coach of the Colts. The Eagles will host Indianapolis in 2018. 29 Ever wonder about that tattoo on Malcolm Jenkins' left biceps? It's not a tattoo. "It's a brand, really," Jenkins said after the 2015 game against New England when he had a 99-yard interception return for a touchdown. "It hurt for about four seconds and then the nerves were burned off, basically, and I couldn't feel it anymore." Ouch. Malcolm Jenkins runs back a 99-yard interception return for a touchdown with teammate Walter Thurmond trailing in an improbably win at New England in 2015. The Eagles were 24.5-point underdogs. 30 Quarterbacks the Patriots have beaten in the Super Bowl in the Bill Belichick era: Kurt Warner, Jake Delhomme, Donovan McNabb, Russell Wilson, Matt Ryan. 31 Quarterbacks the Patriots have lost to in the Super Bowl in the Bill Belichick era: Eli Manning. 32 Gene Steratore is the head referee. This is his first Super Bowl. His biggest adventure this season was using a piece of paper to determine a critical Dallas first down against Oakland, which set up the game-winning field goal. 33 Tom Brady is 29-4 since serving that four-game suspension at the start of 2016 for his role in deflating footballs. 34 Running back James White's 14 receptions last year were a Super Bowl record and a personal best. His previous high was 10, which he first accomplished in that 2015 game against the Eagles. 35 The Birds were first in rushing defense, but vulnerable to running backs catching the ball. Minnesota's Jerick McKinnon had 11 catches for 86 yards in the NFC championship. 36 Speaking of birds, the glass panes that ring Minnesota's U.S. Bank Stadium generate reflections that confuse birds. In a study done by the Minneapolis Audubon Chapter released last February, observers found 60 birds had been killed flying into the stadium during a 2016 migration period. Two migrations per year computes to more than 360 poor dead guys over a three-year period. 37 Ron Jaworski and Donovan McNabb combined to throw six interceptions in their Super Bowl games as Eagles quarterbacks (three each). Tom Brady has thrown five in the seven Supes he's played. 38 Brady has earned $487,000 in Super Bowl shares in his career — $403,000 in his five wins, $84,000 in two losses. Players on the winning team this year receive $112,000, losers get $56,000. Eagles punter Donnie Jones wrote a book after LSU won the 2003 National Championship. 39 Eagles punter Donnie Jones wrote a book about LSU's 2003 national championship titled Nine Seconds To A Championship. His punt bounced and rolled and killed off the final nine seconds of the game, which he probably wouldn't do on Sunday. 40 Patriots kicker Stephen Gostkowski had made 22 consecutive postseason field goals before missing a 53-yarder against Tennessee in the divisional round. 41 Minneapolis-area rideshare drivers threatened on social media last week to intentionally drop off Eagles fans at wrong locations in retaliation for the way Vikings fans were mistreated at the NFC championship. 42 Vegas sports books took $138,480,136 in Super Bowl wagers last year. It is a record they expect to break this year. 43 The over/under for Brady's passing yards is 290.5 yards. For Nick Foles, it's 271.5. 44 Eagles linebacker Dannell Ellerbe has one interception in 11 career postseason games. It came off a deflected Brady pass in the AFC championship during Baltimore's Super Bowl run following the 2013 season. 45 Eagles defensive tackle Beau Allen is from Minnetonka, which is 10 miles west of Minneapolis. Three notable NFL Minnesota natives are Larry Fitzgerald, Terrell Suggs, and former Raiders center Dave Dalby. 46 LeGarrette Blount and Chris Long are trying to become the latest players to win back-to-back Super Bowls with different teams. Deion Sanders is the most prominent, winning Supe 29 with San Fran and 30 with Dallas. Ken Norton is the only player to win three consecutive Supes. He was with the Cowboys for SB 27 and 28 before moving to San Fran for SB 29. 47 Long and Blount would be the first to beat their former teams in the Super Bowl the following season. 48 Blount averaged 12.5 rushing attempts before Jay Ajayi was acquired and 8.8 after. "You can't be selfish when everybody has one common goal," Blount said. "You have to make sacrifices for the betterment of the team. We've done that and it's gotten us this far." There’s a softer side to Patriots head coach Bill Belichick, shown here on the left shaking hands with Eagles defensive tackle Fletcher Cox at Monday night’s Super Bowl media availability. 49 Bill Belichick's father, Steve, was an assistant coach at Navy when Joe Bellino won the 1960 Heisman. Belichick, 8 years old at the time, was so close to the star player that Bellino gave him his graduation cap. According to a 2012 profile in the Boston Globe, Belichick returned the cap to Bellino after his father died in 2005. "He said, 'Maybe your grandkids would like it,' " Bellino recalled. 50 Eagles running back Jay Ajayi was nearly kicked off the team while at Boise State for stealing sweatpants from a local Walmart. He was fined $389.50, ordered to perform community service, and spent more than a year in coach Chris Peterson's doghouse. 51 Ajayi, who was acquired from Miami for a fourth-round pick on Oct. 31, has gained just 75 yards on 28 carries in three career games against the Patriots. He's the first player in history to rush for at least 400 yards for two teams in the same season. He gained 465 with Miami (66.4 per game) and 408 for the Eagles (58.3), playing in seven games for each. 52 The Eagles were 7-1 at the time of the trade. "We found ourselves in an interesting situation where this is Year 2 of the plan, but we have a quarterback [Carson Wentz] that was advancing by leaps and bounds and a team that was playing great," owner Jeffrey Lurie explained. "We thought, 'Why can't we win it all?' "
Just one more win will be the answer to Eagles’ fans prayers.